John N. Kerr, a former Hughes Helicopters Inc. vice president and the company's first director for the AH-64 Apache Attack Helicopter program, died September 22, 1984 after a long illness. 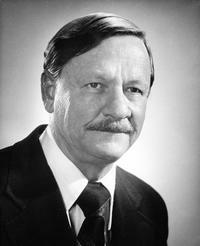 Kerr, who was the AHS president from 1980–81, had been active as an engineering consultant for his own firm, JNK Associates, in recent years. Kerr was born October 29, 1919. He graduated from University of California at Berkeley with a Bachelor of Science in Engineering in 1942. Before coming to Hughes, he was Director of Product Engineering at Northrop-Ventura, part owner and Vice President of Space Equipment Corporation, part owner and Vice President of Engineering at Horkey-Moore Assocaiates, Chief Project Engineer and Chief of Associated Projects at Northrop. Prior years were at North American Aviation as project engineer, design specialist, and structures analyst on such aiecraft as the P-51, F-86, AJ-1 and F-100. He retired from Hughes Helicopters in 1981 after serving for 15 years as director of the OH-6 Light Observation Helicopter Program, vice president of the Military Helicopter Division and vice president of the Advanced Attack Helicopter Program. Under his guidance, Hughes developed a winning design – the AH-64 Apache – for the Army's advanced attack helicopter requirement. A total of 675 Apaches is scheduled for the Army inventory. Recently, Kerr's involvement with the Apache was singled out. He was presented with the prestigious Department of Defense Commander's AAA Award for Public Service. The citation reads, in part: "During the period 1972 to 1981, Mr. John Kerr significantly contributed to the accomplishment of the Army mission through his dedicated service to the AH-64 helicopter program. As program director, his leadership and engineering ability resulted in the final design of the highly successful AH-64... which is the Army's most capable anti tank helicopter, andadds a new dimension to the Army's fighting capability."